Description: IMRL eastbound waits for westbound BNSF to cross. Description: BNSF Westbound Bare Table ( Empty ) Intermodal Train at Daggett, Ca. 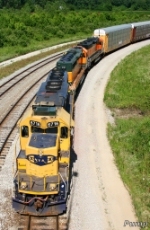 Description: NS Eastbound Freight Train passing through South Bend, In. Description: A very nice looking SD40-2. Description: Renumbered to BNSF 1728. 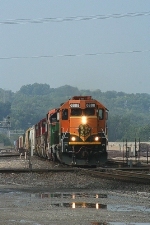 Description: The BNSF Local heads into Voltz Yard with a long sting of autoracks to be loaded at the auto facility. Description: Transfer from BNSF Argentine Yard to BNSF Murray Yard gets ready to head north on the KCT at Santa Fe Jct. Description: One of the best consists I've seen in a long time rolls towards the Incline on KCT Trackage on its way from BNSF Argentine Yard to BNSF Murray Yard as a coal empty waits its turn with BNSF 5772 leading.